General Hospital (GH) spoilers reveal that Nelle (Chloe Lanier) has big plans for Carly (Laura Wright). She filled Ava (Maura West) in on her goal and suggested that neither one of them would have to worry about Carly for long. Nelle intends to hit Carly where it hurts, so expect some serious manipulation tactics. Of course, Ava tried to poke holes in Nelle’s strategy. She knows Carly’s a formidable foe and the circumstances aren’t ideal. Nelle had an advantage when she first came to town. She played the game well and Carly never saw her coming. However, things are different this time around. Carly realizes what Nelle’s capable of. She’ll undoubtedly be watching her enemy like a hawk. There’s much more at stake now that a baby’s on the way. 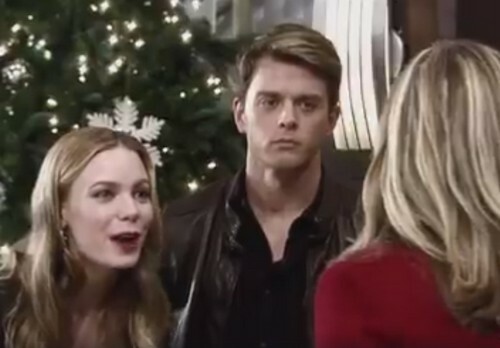 General Hospital spoilers say Nelle’s takedown plan could come with some complications. It appears Nelle wants to prove Carly’s an unfit mother and hopefully eliminate any future custody issues. Nelle doesn’t want Carly swooping in to steal her kid like she did with Avery (Ava and Grace Scarola). Unfortunately, Nelle’s plot is bound to backfire eventually. Even if she manages to achieve a short-term victory, there are certainly going to be consequences down the road. Let’s say Nelle’s scheme works initially and Carly looks like a monster in court. Nelle may get some peace of mind about her baby and Ava could get Avery back. What would happen next? General Hospital fans know Carly never loses for long. That’s just not how GH rolls! Carly may be down, but she definitely won’t be out. Carly could turn the tables with a plot of her own. She could decide to take care of her problem once and for all. Nelle’s crazy side comes up a lot on the ABC soap. She spent a year in a mental institution and it’s clear that something’s off behind those wild eyes. Carly may prey on Nelle’s problems and set her up for a huge fall. She could gaslight Nelle or do something else that makes Nelle look completely out of her mind. It shouldn’t be that hard considering Nelle’s track record. Naturally, Carly would wait until after the baby’s born. She wants to make sure Michael (Chad Duell) has a chance to raise this kid without Nelle’s interference. Once their son or daughter arrives, Carly could launch her ruthless plan and potentially put Nelle back in a nuthouse. Nelle’s about to play with fire, but she could be the one who gets burned in the end! General Hospital spoilers state that some chaos is coming up, so keep watching. We’ll give you updates as other news emerges. Stick with ABC’s GH and don’t forget to check CDL often for the latest General Hospital spoilers, updates and news.